Jewish noodle kugels are so delicious and they can be made in so many different ways, including sweet and savory. But noodle-less? Yes, with zoodles or zucchini noodles. Since trying to swear off noodles (so hard for a Slav to do! ), I've had my eye on the machine-run spiralizers to make zoodles. Well, the spiralizer attachment from KitchenAid works like a champ and I'm happily eating "noodles" again! This Zoodle kugel recipe is great for Passover and, if gluten-free matzo is used, it's ideal for those with wheat issues. Using a spiralizer on the thick "noodle" setting, make long noodles out of the 5 unpeeled and trimmed zucchini. A vegetable peeler can be used instead but you will get flat ribbons, not noodles. Heat 1 to 2 tablespoons olive oil in a large sauté pan over medium heat. Sauté zucchini noodles in batches for 3 to 4 minutes each until slightly soft. Add a pinch of salt and pepper with each batch. Place the cooked zucchini in a colander and drain excess liquid. Heat oven to 350 degrees. Heavily coat a 9x13-inch baking dish with cooking spray and place in the oven to heat up while you prepare the remaining ingredients. In a large bowl, whisk together 4 room-temperature eggs with 2 teaspoons lemon zest, 1 clove minced garlic, 1 cup finely chopped onion, mint and basil (if using), 1 1/2 teaspoons salt, 2 teaspoons pepper (or to taste) and 1/2 cup matzo meal. Add drained zucchini and stir gently until completely mixed. After oil has heated in pan around 5 to 10 minutes, add zucchini mixture to pan. Using a spatula or the back of a spoon smooth out top. Make the topping by mixing 1 cup crushed matzo crackers with 1 tablespoon chopped parsley. Scatter crushed matzo crackers over the top. If desired, mix matzo crackers with 2 tablespoons melted margarine and then scatter over top. Bake for 45 to 55 minutes or until edges are crispy and the kugel is set in the middle. If the topping is browning too fast, cover the kugel loosely with foil. You may need to drain off excess liquid and place back into the oven for an additional 5 to 10 minutes. Once kugel has cooked through, remove from oven and allow to cool for at least 20 minutes before cutting. Serve at room temperature or warm. Source: Inspired by a recipe from MyJewishLearning.com. A kugel is a baked pudding made with egg noodles or potatoes, and a custard of eggs, milk or cream, curd cheese or cream cheese, sour cream and spices. It can be sweet, in which case sugar, raisins, and cinnamon are often added to the custard base, or savory when meat and vegetables are added. It is served as a dessert, side dish or a meatless main course. 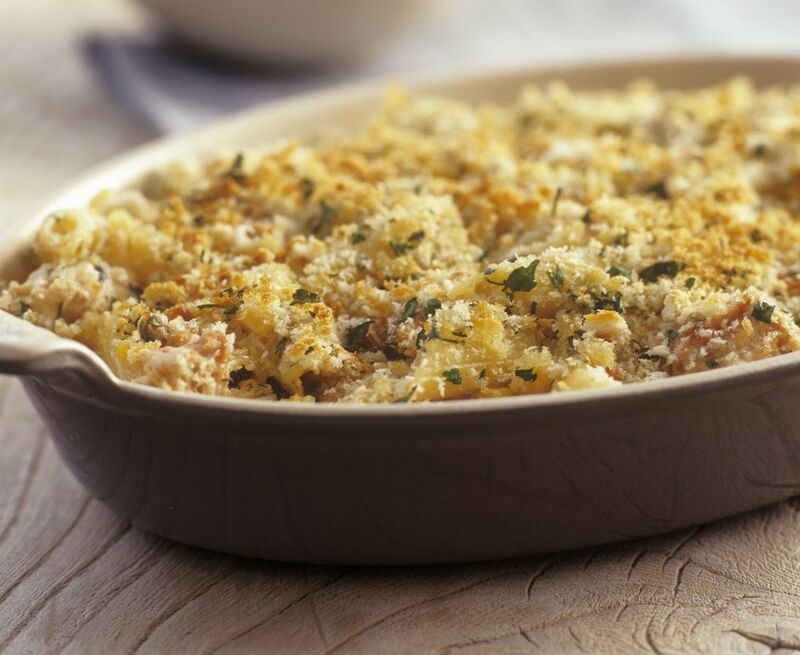 Although generally considered an Ashkenazi Jewish dish served especially for Shabbat and Yom Tov, there are Polish, Lithuanian, and other Central and Eastern European versions of kugel.